SONOSIM SUMMARY: This study published in the American Journal of Emergency Medicine looked at the accuracy of bedside ultrasound by emergency providers for determining gestational age by measuring crown-rump length. Emergency providers of varying levels of training at an urban county hospital were able to measure crown-rump length in a short amount of time, and the results were highly correlated with those of ultrasound technicians or senior OBGYNs performing comprehensive sonography immediately thereafter. This supports the use in subsequent decision making of delivery dates estimated by crown-rump length for pregnancies initially assessed in the emergency department. 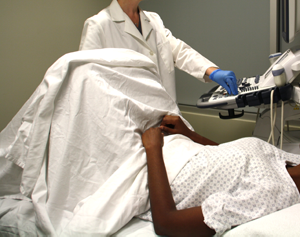 The objective of this study is to evaluate the accuracy of emergency providers (EPs) of various levels of training in determination of gestational age (GA) in pregnant patients using bedside ultrasound measurement of crown-rump length (CRL). We conducted a prospective, cross-sectional, observational study of patients in obstetrical care at an urban county hospital. We enrolled a convenience sample of women at 6 to 14 weeks gestation as estimated by last menstrual period. Emergency providers used ultrasound to measure the CRL. Repeat CRL measurements were performed by either an obstetrical ultrasound technician or senior obstetrician and used as the criterion standard for true GA (TGA). One hundred five patients were evaluated by 20 providers of various levels of training. The average time required to complete the CRL measurement was 85 seconds. When CRL measurements performed by EPs were compared with the TGAs, the average correlation was 0.935 (0.911-0.959). Using standard accepted variance for CRL measurements at different GAs according to the obstetrics literature (±3 days for 42-70 days and ±5 days for 70-90 days), correlation between EP ultrasound and measured TGA was 0.947 (0.927-0.967). Emergency providers can quickly and accurately determine GA in first-trimester pregnancies using bedside ultrasound to calculate the CRL. Emergency providers should consider using ultrasound to calculate the CRL in patients with first-trimester bleeding or pain because this estimated GA may serve as a valuable data point for the future care of that pregnancy.